Archbishop Desmond Tutu and the Dalai Lama have been friends for many, many years. Between them, they have endured exile, violence and oppression. And in the face of these hardships, they have continued to radiate compassion, humour and above all, joy. To celebrate His Holiness’s eightieth birthday, Archbishop Tutu travelled to the Dalai Lama’s home in Dharamsala. The two men spent a week discussing a single burning question: how do we find joy in the face of suffering? This book is a gift from two of the most important spiritual figures of our time. Full of love, warmth and hope, The Book of Joy offers us the chance to experience their journey from first embrace to final goodbye. "I want to wish all of you joy—because there is no better gift. 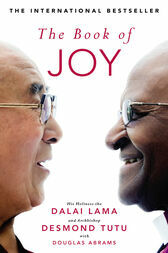 Two spiritual masters, the Dalai Lama and Archbishop Desmond Tutu, share their wisdom in this uplifting book. I promise you, it’s the best $26 you can spend." His Holiness the Dalai Lama is the spiritual and political leader of Tibet. Today, he lives in exile in Northern India and works tirelessly on behalf of the Tibetan people, as well as travelling the world to give spiritual teachings to sell-out audiences. He was awarded the Nobel Peace Prize in 1989. The first black Archbishop of Cape Town, Tutu has won the Nobel Peace Prize for his leadership of the South African Truth and Reconciliation Commission and today is Chair of a group of former world leaders, The Elders, which aims to tackle some of the world's most intractable problems. He has helped calm the political crisis in Kenya and regularly speaks out against Mugabe, Israel, the Iraq War and the Burmese junta, but is also noted for his irrepressible sense of humour and deep spirituality. He lives in South Africa but travels widely.